Human brain produces electrical signals of various frequencies depending on its functioning. These signal are transmitted through neurons and ultimately lead to various mental and physical activities. Brainwave patterns are typically grouped into four different categories: Alpha, Beta, Theta and Delta. Each of these brainwave patterns is associated with various states of mind. What happens when a reverse process happens ? i.e. instead of being in a particular state of mind and thereby diagnosing the brainwave corresponding to that state, if one applies the same frequency signals externally to brain ? The result is altered state of mind, and so one can in-principle use brainwaves to achieve altered state of mind e.g. meditative state. Alpha Waves It is believed that many creative people are most of the time in Alpha state than others. 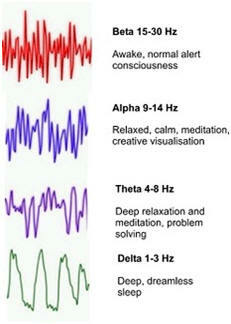 Alpha waves are between 9 and 14 Hz and occur when the body is awake and at rest, not asleep, and the eyes are closed. You may feel intellectual relaxation, deep relaxation or meditation when in Alpha. Alpha brainwave rhythms produce: warm hands and feet, peaceful feelings, a sense of well-being, improved academic performance, improved sleep, increased productivity in the workplace, reduced anxiety and improved immune functioning which counters the negative affects of Cortisol. Theta Waves are between 4 and 8 Hz and are commonly referred to as the dream or "twilight" state. Memory development is enhanced in this state. In the Theta brainwave state, memory is improved, and access to unconscious material, sudden insight, free association and creative ideas is increased. Theta is associated with REM and dreaming states. Delta Waves are observed when in a sleeping state. Delta waves are the slowest of brainwaves spanning from 1 to 3 Hz in frequency. As we fall asleep the dominant brainwave becomes Delta. ScienceDaily (Mar. 31, 2010) — Forget about crystals and candles, and about sitting and breathing in awkward ways. Meditation research explores how the brain works when we refrain from concentration, rumination and intentional thinking. Electrical brain waves suggest that mental activity during meditation is wakeful and relaxed (click here to read more). Let us try to understand the Brain Pathology: Electroencephalography (EEG) is the recording of electrical activity along the scalp produced by the firing of neurons within the brain. In clinical contexts, EEG refers to the recording of the brain's spontaneous electrical activity over a short period of time, usually 20–40 minutes, as recorded from multiple electrodes placed on the scalp. Associated with inhibition of elicited responses (has been found to spike in situations where a person is actively trying to repress a response or action) (Kirmizi-Alsan et al. 2006). 8 – 13 posterior regions of head, both sides, higher in amplitude on dominant side. Central sites (c3-c4) at rest . Also associated with inhibition control, seemingly with the purpose of timing inhibitory activity in different locations across the brain (Klimesch, Sauseng, & Hanslmayr 2007; Coan & Allen 2008). A decrease in gamma band activity may be associated with cognitive decline, especially when related the theta band; however, this has not been proven for use as a clinical diagnostic measurement yet (Moretti et al. 2009). Shows rest state motor neurons (Gastaut, 1952). sensorimotor rhythm aka mu rhythm. Wish to try out some brainwaves ?????????????? You may download some of the brainwaves from http://anupamaholistics.4shared.com (you must use a headphone to listen to these brainwaves, otherwise it has no effect, as these brainwaves are binaural beats created by beating of different frequency sounds in two ears).